If you have a pulse and an Instagram account, Charleston, South Carolina is sitting high on your bucket list. Known for its laid-back lifestyle, beautiful scenery, rainbow colored buildings, plenty of Southern Charm (Bravo TV, what's good? ), and really good eats, it's no surprise that it's a top choice for vacationers - and wedding parties. Charleston is the #2 wedding destination in the country, right after Las Vegas, so be prepared to share late-night sidewalks with a million bridesmaids. There is so much to do, most of which revolves around eating and drinking, so get ready to over-indulge, and sip rosé on well-appointed rooftops across town. 1.) Hot/cold attitudes. The locals are lovely - seriously, we had so many great conversations with Uber drivers that one time we literally forgot to get out of the car for a full three minutes after reaching our destination - but sometimes, service in restaurants and bars can be pretty dismal. I don't know if it's because of tourist fatigue, but I experienced pretty bad 'tude - a brewery bartender straight up ignored me when I tried to make small talk about my brewery back home, and we received plenty of "you're bothering me, what tf do you need" looks/tones from hosts and servers. Even servers who were actually pretty great did initially give us the "You're not from around here" up-and-down before acknowledging us. Hey, I totally get it - I'd be over it too if my town was a top tourist destination. 2.) There is some level of controversy about the horse and carriage rides. I noticed right away - literally, on the in-bound Uber ride from the airport - a billboard decrying the practice, pointing out how inhumane one horse + seventeen humans is, especially in the Southern heat and humidity. Most of the carriages are for two or four people, but I did see some that looked like buses, and a count did show that there were up to sixteen or seventeen people in them. On the carriage ride route, we passed a lot of homes that had banners hanging out of windows calling to end the practice. Our guide, naturally, didn't see the problem - he assured us that the horses got lot of breaks and were in constant rotation, and that they are even sent for R&R to a farm outside of the city for a majority of the year. Not sure if I believe that (hey, he does have an incentive to lie or exaggerate), but I hope it's true. 3.) Charleston has a history with slavery, and it's still part of everyday life. If you ask someone for directions downtown, they'll guide to with directions like "Walk past the Old Slave Market," for example. (Our guide on the horse and carriage ride also told us that the Old Slave Market was where slaves shopped, not where slaves were bought and sold. Again, not sure if that's true or if that's PR.) Another example - lots of people will suggest visiting nearby plantations, calling them "gorgeous" or "a good place to hang out for a day," seemingly forgetting their original purpose and use. 4.) It's cocktail hour all the time. Seriously. Rosé all day is a way of life here, the cocktails are artful and strong, and there are so many great local breweries that every bar and restaurant across town has a solid beer lineup on the menu. Sitting on a rooftop or in an air-conditioned hotel bar (not just for tourists!) with a cool cool beverage is the perfect way to see and be seen. Here are some of the spots I loved during my summertime stay - from dive bars to the s.n.o.b.biest restaurant in town, plus some shopping and sleeping options, too. Then, scroll down for an insiders-only list of beloved restaurants fun activities, courtesy of my pal Katherine Curtin, a former long-time resident of Charleston. The Pastrami'd Swordfish Sandwich, a special from 167 Raw. This is the spot for a little slice of Cape Cod right in the middle of Charleston. 167 Raw has a sister location in Nantucket, and sliding into a seat at the admittedly tiny restaurant really feels like you're in New England, if New England was a charming neighborhood in the South. They are famous for their authentic Lobster Rolls and impossibly fresh oysters, and they get creative with beautiful daily specials, too - when I went, it was Pastrami'd Swordfish that the server encouraged me to try (I was a little skeptical, I admit...) and when I did, I nearly wept it was so delicious, flavorful, and juicy. They're also pretty well known for their pulled pork taco - a little compromise of sorts, as it's decidedly not seafood, but it is one of the owner's favorites and an infamous house specialty. The John's Island location is a 20 minute Uber ride from downtown, and it's definitely worth it. Housed in what feels a bit like a big cottage - complete with a front porch and rocking chairs and a bar that opens up into the dog-friendly backyard - this is the place for comfort food. Case-in-point: Despite the July heat, I immediately opted for the Thanksgiving Sandwich with cranberry sauce and stuffing. It was so delicious, especially paired with their famous Duck Fat Fries. This also seemed to be the go-to after work spot for restaurant industry folks - there was a steady stream of regulars all looking to drink with some familiar faces after a shift. Grab some food and then bring your beer outside to people watch in a rocking chair as you listen to the crickets in the wooded parking lot. You'll feel riiiiight at home. The rooftop at Revelry Brewing. 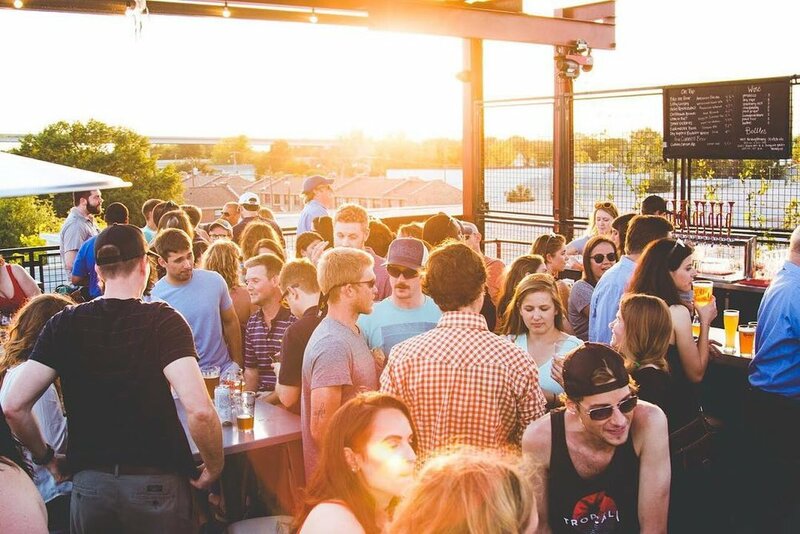 Image via Revelry Brewing Co.
A short uber ride from downtown, this sizable brewery features live music on weekends and a food truck downstairs, and a huge, pup-friendly rooftop with a second bar upstairs, perfect for catching a breeze and enjoying the view. On a Saturday afternoon it was buzzing with people and great vibes. Ask anyone for a restaurant recommendation in Charleston, and this place will more likely than not be on just about everybody's list. It is a little snobby; it's an older crowd - think: your parents - and dinner and drinks for four at S.N.O.B. are a splurge, but the amazing food (especially the seafood) and beautiful cocktails are worth every penny. The open kitchen means you can watch your meal being prepared, especially if you sidle up to a seat at the long hightop communal table that directly faces the kitchen - a more entertaining alternative to a spot at a regular bar, for sure. Finish with a big old slice of Apple Pie for dessert - just make sure you have someone to share it with, this giant slice of heaven will do you in. S.N.O.B. is right downtown, so after dinner you'll be able to walk to a ton of bars and rooftop lounges for a night out. Worthwhile stuck out to me like a sore thumb while I was perusing the shops downtown. Don't get me wrong - Charleston has a style of it's own, but let's just say that it's generally pretty preppy. So glancing over and seeing drop-crotch wool harem pants on a mannequin made me do a double take, and I didn't have to think twice about popping inside. I loved checking out hard-to-find indie and international brands like Umit Unal, a Turkish designer I love, as well as small batch perfumes and handmade housewares and paper goods. Style-wise, think Chloe Sevigny as Lizzie Borden, or just as, you know, herself. A staffer at Worthwhile actually sent me to Sneaker, and I point this out because you are not very likely to stumble upon it unless you're on a mission, although I imagine any sneaker head or collector has already worn a path to the shop. Sneaker is tucked away down a very cute little alley that reminded me of the little vias in Palm Beach, although inside, with exposed brick walls and museum-style lighting. it feels more like Brooklyn. The Restoration Hotel in Charleston. Image via Facebook. The only downside to staying at The Restoration is that there is so much to do/see/buy/eat/drink within the hotel that you might never leave to explore the city! There are lots of beautifully appointed spaces to enjoy, like the Library, where you can browse chic coffee table books or catch up on emails, and the rooftop pool. There's Amethyst Spa and Nail Bar, the on-site spa (go for a pedicure, especially if you have just spent the day exploring the city on foot, like I did), The Rise Cofffee Bar, and The Port Mercantile, a shop selling everything from Krewe sunglasses to small-batch beauty supplies, candles, handmade kitchen wares, and locally made jewelry and bags. There's also a restaurant, The Watch, where you'll want to do just that - watch locals and travelers alike as you snack on deviled eggs and handmade cocktails. The Rise at The Restoration. The Port Mercantile at The Restoration. Check out local artists, such as Carrie Beth Waghorn, while you're in town. There are tons of art galleries, and, contrary to my initial belief, you'll find a fair share of contemporary art here as well. The Southern, Meyer Vogl, and Miller Gallery are great places to start. Charleston is a pretty small, walkable city. King Street is where all of the restaurants and shopping takes place. The shopping is everything from cute boutiques to really high end. There are some great finds here. East Bay Street is the other street with lots going on. One activity that I would say is a MUST is the carriage ride. It's tons of fun and you'll get lots of cool information about the city. You can get a carriage right downtown by the open air market. Also, walk down and check out the Battery (the edge of the city on the water). It is beautiful and the houses are breath taking. The famous Rainbow Row houses are also down there! 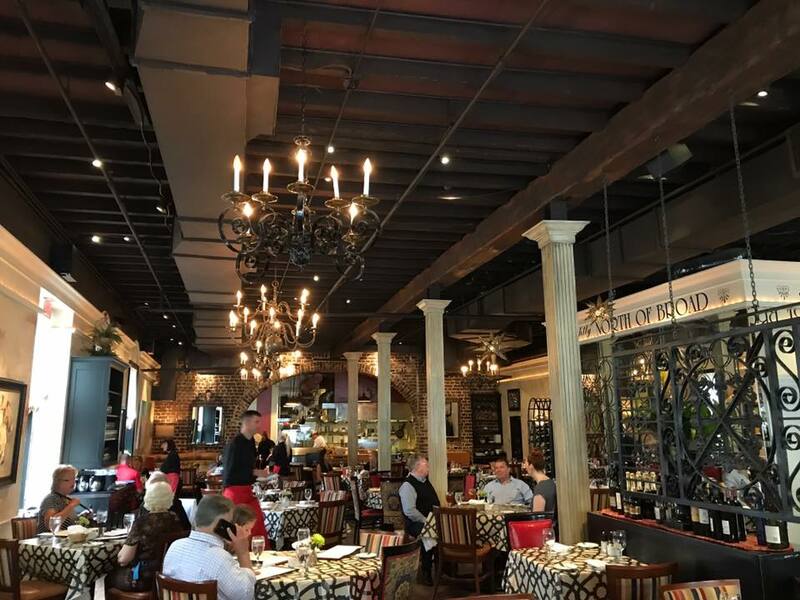 Here are a few of my recommendations for places to wine and dine! Charleston is known for it’s amazing food so be sure to bring lots of loose fitting clothes. This is on Sullivan’s Island (only two blocks from the beach) - this is where I worked the majority of my time living down there. It is very casual and beachy. They are known for their fish tacos, crazy burgers toppings (fresh ground meat on site) and great ambiance. It is seat yourself in the entire place so if you spot a table, grab it! It WILL get packed. Keep your eyes peeled for the celebs… Bill Murray, Stephen Colbert and others frequent Poe's. Same owners as Poe’s. They have two locations - there is one located downtown on Huger Street and one out on Folly Beach. They have great Mexican food. This is another laid back, casual place with great food and ambience and will also be packed. I also worked here when I lived down there. They have great food. It is more fine dining and only open for dinner and weekend brunch. It was also in an episode of Southern Charm (if you watch that!). You will not be disappointed with their food. It is seriously all good. If you go for brunch, don’t pass up the Chicken and Biscuits with southern gravy. mmmm my mouth is watering! Shem Creek: Various places to choose from. You will not always find great food on the creek (unless that has changed). But it is a great spot for some cocktails out on the water and phenomenal people watching. There are always people pulling up in their boats and you are sure to spot some dolphins showing off. I recommend going to Red’s Ice House if you are looking for super laid back and you want to fit in with the locals or check out Water’s Edge! The food at Water’s Edge will be your best bet on the creek. I do think a new place opened since I left though that is supposed to be good. This is one of my favorites. They just got named #1 Steakhouse in America. But they have great fish as well. The ambiance is really nice and you will have a great meal. It is also great for a cocktail and people watching. You will get a good feel for the Southern gentlemen schmoozers here! Billy Hall will most likely greet you at the door in his very think accent and thank you for coming in like you’ve known him your whole life. If you do dine here, ask to see the tray of cuts. It is just neat to see. They can tell you the cows name and the farm it came from (pretty neat). CRAFT BEER!! This is your spot for great craft beer. There are sure to have some great drafts from local breweries (Holy City Brewing, Coast Brewing, Westbrook Brewing, Palmetto Brewing, Freehouse Brewing). The food menu is a little funky and basic but the food is great. They are also owned by Poe’s and Taco Boy (these people know what they’re doing). This is in the heart of downtown and right next to the famous outdoor markets. This hotel is VERY fancy but you just walk through the lobby to the elevators and take them to the top! The lobster pizza is one of the best things you will ever taste. This place is not cheap but great for views of the city (you can see why they call it the Holy City with all of the churches in the skylines) and a cocktail and an appetizer. The pizza is not huge and good to split. Great southern food! I love to sit at the bar here and enjoy a good meal and some wine. The southern cuisine is great! **They also own The Old Village Post House (Mount Pleasant). http://www.mavericksouthernkitchens.com/oldvillageposthouse/ This is a hidden gem. The food will not disappoint and it is nestled in a great little neighborhood. There is an inn above it which is super neat. It is a small place but you will definitely be bumping into some locals and enjoy your time here. This is a very small, not too fancy place but the food is phenomenal. If you are able to get a reservation… GO! It’s 5 courses for $25 and everyone gets the same thing. It’s basically a chef’s table and you watch them cook. It is all fresh stuff which they get that day from farmers, fishers, bakers, etc. Voted one of America’s best restaurants. It is a seafood and oyster place. You will see oysters on almost all menus in Charleston. The ambiance of this place is awesome as it is in an old bank. This is located downtown. Their other restaurant, FIG, has also been voted one of the best in the country. So, I would highly recommend one of the two but The Ordinary ambiance is hard to beat. I would recommend trying to get a reservation though as this is a hot spot! This is a Southern kitchen with great sandwiches. The menu changes daily so you have to go in and see the chalkboard or look on their Facebook page to find out what they are serving that day. It's a good lunch spot. “Asian Soul Food.” Enough said. Great food, no frills. It is an oyster place. Looks like it could be on diners, drive ins and dives. Neat place! The food is delicious and reasonably priced. Recently opened but everyone down there has been trying it and saying how good it is. It's worth a try for some good southern BBQ! Aug 25 Instagram Fail: Don't Use Social Media To Plan Your Vacation... Here's Why.